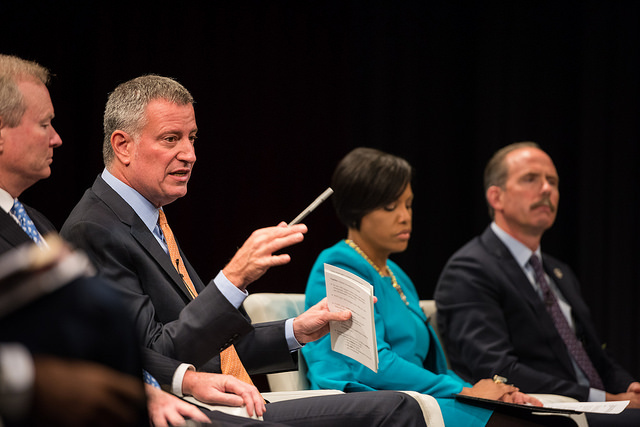 In a surprise move on Monday, Mayor Bill de Blasio declared during a NY1 television appearance that going forward his communications with five outside advisors would be subject to public disclosure. In doing so, the mayor betrayed his own rhetoric from a week prior when he vigorously defended his actions in keeping those communications confidential and maintained that “the highest standards were adhered to” in his dealings with unpaid consultants, some of whom have clients with city business. The Campaign for One New York, which de Blasio has repeatedly said was OK’d by the city’s Conflicts of Interest Board, raised unlimited funds from wealthy donors who have business with the city, including labor unions and real estate developers. The now-defunct group, which voluntarily disclosed its donors, is under federal and state investigation to determine whether donors were offered or received political favors from City Hall. No one has been charged with wrongdoing and the mayor has insisted that he and his allies sought proper guidance and conducted themselves ethically and legally. The administration has sought to keep the communications with his unpaid consultants, termed “agents of the city,” exempt from disclosure under the Freedom of Information Law, inviting a lawsuit from the New York Post and NY1 for their release. Two weeks ago, the day before Thanksgiving, the administration released some of those communications, just over 1,500 emails dating back three years, exchanged with one of the consultants, Jonathan Rosen of the BerlinRosen firm. But the mayor’s argument has not swayed good government groups who would like to see a higher standard of conduct and more transparency from a mayor who campaigned on that very promise. On Monday, the mayor sought to make a move towards more openness, telling anchor Errol Louis on NY1’s Inside City Hall that he would no longer shield communications on government matters with outside consultants. He described the move as necessary since the email issue had “obviously become a distraction” to his administration, but in doing so, he effectively acknowledged a higher standard to follow. Meanwhile, earlier communications with those “agents” are still being held confidential and the lawsuit continues. “It’s hardly the highest standard when the response of the administration, in my opinion, is inconsistent with law,” said Robert Freeman, executive director of the state Committee on Open Government, which provides guidance on the state’s Freedom of Information law. “A consultant according to the state’s highest court refers to persons or entities retained by the city,” he added, pointing out that the mayor’s advisors are private citizens who are not on the city’s payroll, which is the basic requirement for shielding communications. Christina Greer, political science professor at Fordham University, faults de Blasio for not matching his lofty rhetoric, but believes he hasn’t done anything untoward. “He should probably refrain from using superlatives in explaining what he’s done,” she said. “But I don’t think it’s been illegal or detrimental.” If there was any illegal conduct, Greer is confident that U.S. Attorney Preet Bharara, whose office is investigating the Campaign for One New York, would have found it by now. Though de Blasio never admitted that the Campaign for One New York was a mistake, he had it shuttered when it too had become a significant distraction. He said it had accomplished its goals, chiefly helping to secure state funding for pre-Kindergarten. But the mayor’s bigger problem, Greer said, is that he faces different pressures than his predecessor, billionaire Mayor Michael Bloomberg. “I really do wonder if this is just the cost of doing business for someone who is not a billionaire and can’t finance his own projects,” she said, insisting that the mayor has to be able to make deals. “If he doesn’t get in bed with wealthy capitalists, how is he going to help poor people. That’s the question for American politics,” Greer said.